The Paladin Prophecy rocks the young adult scene with the latest and greatest hero - Will West. Opening with a quiet intensity, Mark Frost adds a humorous plot and deep, endearing cast of characters to a brilliant world of mystery and adventure. Peaceful Southern California sets the stage for the beginning of Will's journey. After spending his life following his Dad's 'Rules to Live By', rules that have kept him unnoticed and under the radar, Will's anonymity is threatened. The results of a test given to students nationwide sheds light on Will's extraordinary mind. Approached by Dr. Robbins, Will is offered a scholarship to a prestigious private academy that could possibly hold the answers to the questions that suddenly arise as his life is thrown into chaos. His parents are compromised and he's chased by men in black caps, proof if he ever wondered why his parents always lived so cautiously during his childhood. Taking a chance on The Center for Integrated Learning is either the worst, or best, choice Will makes. Here he discovers the physical and mental potential his body may have and forges friendships with kids he can finally relate to. The Center also seems to be the place that does grant Will answers to his questions while dredging up many more for consideration. Frost puts Will and his new comrades: Nick, Ajay, Elise and Brooke through the toughest obstacles, but their teen resilience and comedic interludes keep all sane, including the reader! There's a strong connection between reader and the story, even when the plot picks up in action. Frost crafted Will and his friends, in particular, with such skill that it's too hard to believe that they're only fictional characters. Their lives and personalities are so relatable that every reader can find something in them that mirrors their own life. 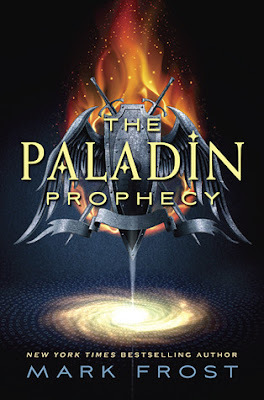 The first title in what is sure to be a thrilling trilogy, The Paladin Prophecy demands attention. Frost gives readers more than just an entertaining novel that mixes ingenious supernatural lore with science-fiction elements. Will West will become part of every day lives and inspire young teens, especially, to explore themselves while reaching out for something more. Frost excels in speaking directly to the younger audience through characterization and hip dialogue, but any age group will enjoy and gain appreciation for The Paladin Prophecy!